When I was recording for the Caedmon album 'Chicken to Hug' I used my James Bisset Fiftieth Anniversary Edition strat almost exclusively. This worked fine until one day the engineer and producer piped up nervously and said the guitar sounded 'thin'. I rolled the tone down on the guitar, but that didn't convince him at all. So we changed amps, fiddled with settings, and even tried using the Dan Armstrong and finally the producer's American Fender Tele. Nothing satisfied. 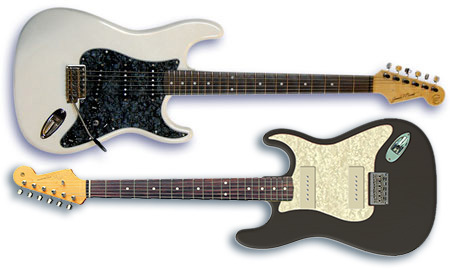 I already had a spare Warmoth strat neck so really, we were almost there. For the body, I cut down a cherry tree which had outlived its usefulness on the allotment. However, the cherry tree trunk will take a couple of years to dry out (if I find someone willing to cut it into boards). And it's going to be a very special, unique piece of wood. I need to know exactly what I'm doing with it before I point power tools at it. So I found an unfinished Strat hardtail body on Ebay for £50 which I could use as a testbed, and a Schaller bridge for £30. That just left the pickups. 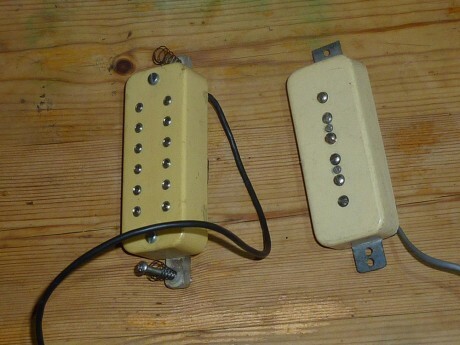 A couple of second hand pickups from my eighties: a (Gibson?) P90 dog ear hybrid and an early Dimarzio super distortion P90 replacement. The Dimarzio I had used briefly in a semi-acoustic where it just screamed mercilessly, but the P90 I had bought and then stuck in a box for a rainy day. Scared of what I might do let loose with a router, a guitar and a kitchen table, I took the bits to Steve at Manchester Guitar Tech. So really, although I conceived the creature, it was Steve who cranked up the pulleys, charged the conductors, and then blasted this monster into life. I already have plans to paint it black and use a cream pickguard, so that it really looks like the antithesis of my cream strat. The pickup test suite is a looped track set up in Logic Studio. All the guitars are DI and then bussed through the same amp simulator - in this instance a preset 'British Blues Combo - clean'. The only difference not clearly indicated by the bakeoff is the volume of the Frankenstrat - monstrous!